Sound emanating from an outdoor stage at a popular Jupiter, Florida restaurant was creating problems for neighbors and challenging local noise ordinances until Acoustifence noise barrier was installed to keep the peace without sacrificing the restaurant’s live music offerings. JUPITER, Florida, June 20, 2011 – The tropical, waterfront setting of Guanabanas restaurant on Florida’s southeast coast invites guests to pull up and dock their boat or arrive by more traditional means, and settle in for a meal, a drink, and most nights, live music. But the acoustics were causing a problem in paradise, as sound from the live music, amplified by the stage’s proximity to the water, was rising to decibel levels above Palm Beach County ordinance limits. (Left) Acoustifence sound barrier attached to perimeter fence before landscaping installation. Guanabana’s Sound Engineer Matt Cahur worked with Paul Getts, an acoustical consultant at Acoustiblok, Inc. in Tampa, to determine the best approach for reducing noise from the outdoor stage during live performances without detracting from the restaurant’s extravagant tropical setting complete with tiki huts and a large customized chickee hut bar, giving the property a definitive Caribbean flavor. Guanabana’s utilizes a wide variety of Florida’s lush tropical vegetation and woods for all of its décor. The stage, tables, chairs, fencing and all wooden structures are made of Florida pine and bamboo. The property itself is generously landscaped with palms, ferns, bromeliads, gladiolus and a variety of additional native flora. The challenge was to find an effective sound barrier that would meet, or even surpass local noise ordinance limits without interfering with the meticulously designed property. “We’ve tried a lot of different sound abatement solutions to stop the noise bleed from our property during the live performances, but nothing worked,” Cahur said. “We have been searching for the right product that will not only address the sound issue, which is exacerbated because of the sound reflecting off the water, but one that we can conceal within the décor. 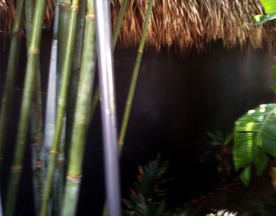 Cahur said the Acoustifence material was easily hung on top of the property’s existing fence, and then concealed with the restaurant’s trademark tropical landscaping, resulting in a sound barrier that is completely undetectable to restaurant guests. 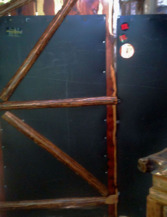 Acoustifence was also hung on the stage door and walls, and concealed with natural wood planks and other thematic décor. Since the Acoustifence was installed, Cahur says the live music is in full gear, and the neighbors are no longer left to deal with the loud music emanating from the stage. “We haven’t gotten a single call since we put the Acoustifence in,” Cahur said. Lahnie Johnson, founder and president of Acoustiblok, Inc., said the application of Acoustifence at Guanabana’s was the perfect combination of sound abatement material and architectural landscaping that can make an outdoor entertainment venue possible almost anywhere. “We designed Acoustifence to install easily, so that it can be used as a temporary or permanent noise barrier,” Johnson said. “The ultimate use of Acoustifence is to conceal it under vegetation or in a garden setting, which gives the illusion that the vegetation is providing the privacy and noise reduction, which is exactly what Guanabana’s has done with excellent results. 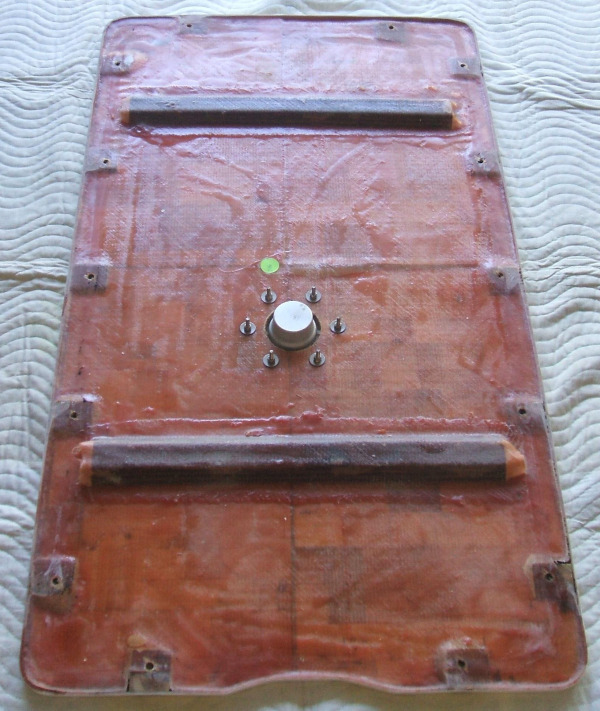 A 1/8-inch (3mm) thick unique sound deadening material measuring 6-feet (1.82 meters) high by 30-feet (9.14 meters) long with black anodized brass eyelets along the top and bottom edge for easy attachment. Heavy-duty nylon ties are included with each roll. Easily installed or removed in less than one hour, impervious to mold, mildew, and UV, Acoustifence is virtually indestructible. The soundproofing material in Acoustifence is a proprietary formula of the Acoustiblok Corporation, developed and refined over a 10-year period. Acoustiblok, Inc. now has available high quality landscape attachments which fit directly over the Acoustifence to provide a realistic landscape appearance. A variety of landscape attachments are available to choose from, including floral gardens, green meadows, English garden walls, and other scenic illustrations to blend into any natural backdrop or enhance an unfinished yard or property. Acoustiblok is recognized and sold worldwide, earning product awards from the British House of Commons, as well as being one of NASA’s Top 49 Spinoff companies. Acoustifence has proven performance in highway environments, construction sites, and waste-to-energy plants, and can accommodate any height fence or structure by simply overlapping the sections. To store, Acoustifence sections simply roll up like carpet into less than a 12-inch diameter. Independent lab tests of the Acoustifence material show a sound transmission classification (STC) of 28, which represents to the human ear an approximately 85-percent reduction in sound. However, results will be less, relative to surrounding sound reflective objects such as buildings or trees and the amount of Acoustifence installed. For more information on Acoustifence, visit the website, call 813-980-1400, or E-mail sales@acoustiblok.com. 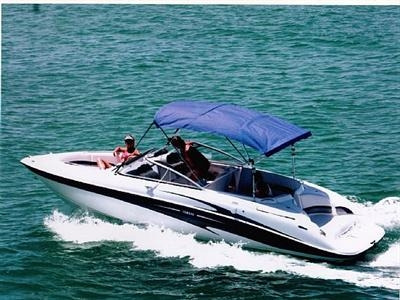 By applying Acoustiblok’s 3mm noise deadening material to the noise source – the engine wall, engine cover and gas tank cover, one Yamaha SX230 (pictured) boat owner reduced unwanted noise on his boat by more than 65-percent. CINCINNATI, Ohio, June 10, 2011 – Summer is here, and, boating enthusiasts everywhere are flocking to the waterways, ready for some relaxing fun in the sun and waves. The idyllic vision of lazy days spent cruising on the water are often met with the unexpected reality of engine noise so loud, conversation becomes impossible and the noise itself becomes an assault on the senses, not to mention the impact on wildlife and local residents living within earshot of the waterfront. Cincinnati residents Roy and Chris Emerson couldn’t wait to hit the water last August in their newly purchased 2007 Yamaha SX230, a 320-horsepower, 23-foot, high output designed for luxury and performance, the perfect craft for spending a comfortable day on Brookville Lake in Cincinnati. What the Emersons didn’t realize until after they launched was the unbearable noise emanating from the boat’s dual engines, a high decibel whine that resonated up through the cabin floor area. The Emersons had to shout in order to carry on a conversation, and the relentless blare cut seriously into the couple’s enjoyment. The thrill of spending recreational time on the water quickly turned sour. “My wife said she didn’t know if she could deal with the noise,” Emerson said. Since the Emersons bought their boat late in the summer, Roy Emerson had the entire winter to research noise reduction options for marine applications. “I belong to a group of Yamaha jet boaters, and I asked some of the other members if they had found any noise reduction material that worked,” Emerson said. 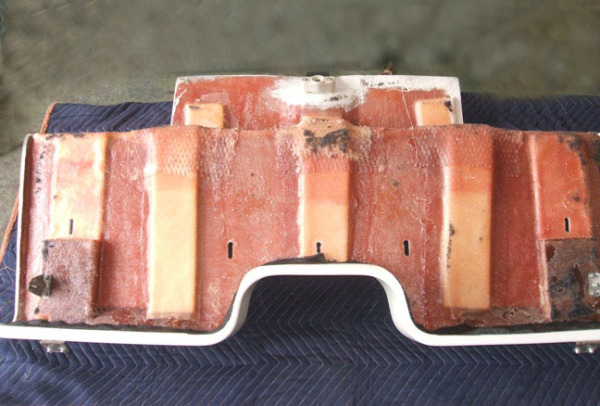 “Almost everyone who had tried one solution or another told me they were disappointed with the results, but one guy had used Acoustiblok on the sides of the engine wall, and he said it worked great. Emerson purchased the 3mm Acoustiblok material with the help of Acoustiblok sales consultant Paul Getts. 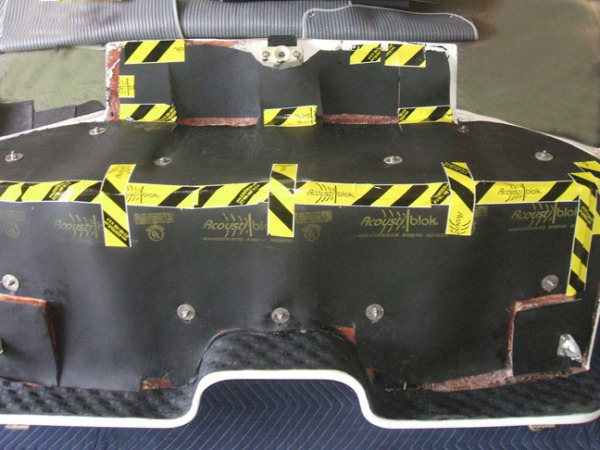 Emerson custom measured, cut, and applied the material himself to the sides of the engine wall, the top of the engine cover, and the large cover that fit over the gas tank area. The result, Emerson said, is a boat so quiet, he and his wife can talk, relax, and enjoy their weekend boating getaways without the rattle, roar, and reverberation that had severely detracted from the enjoyment of their boating experience and caused them to second-guess their choice of recreation. Emerson completed the project just in time to enjoy the entire summer cruising and relaxing on the waters of Brookville Lake and Lake Cumberland in Somerset, Kentucky, two of the couple’s favorite boating spots. 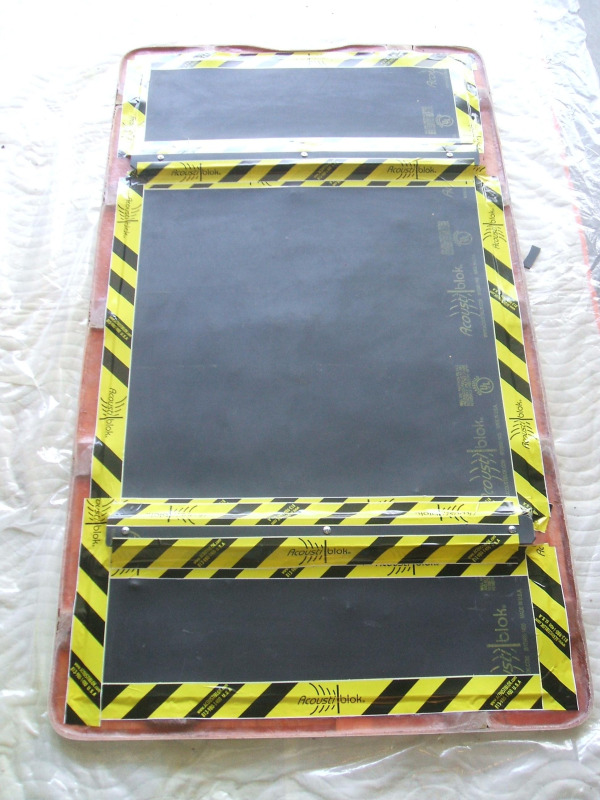 For more information or to view a video demonstration of Acoustiblok’s sound deadening capabilities, visit the website at www.Acoustiblok.com, call 813.980.1400, or e-mail sales@acoustiblok.com.